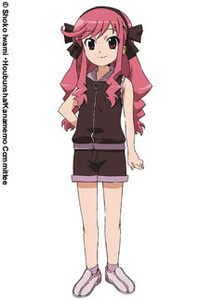 She is Kana's classmate and also works for a rival delivery company. She comes from a wealthy family, and often calls others in her class commoners. She met Kana when they both got stuck in the rain and were looking for shelter. She didn't know where the next delivery should go, so Kana helped her. Since Haruka is lolicon she likes her a lot. She seems to have feelings for Kana and started worrying when she thought Kana had a boyfriend.